One of Google’s top Android executives is leaving the company. Hugo Barra, whose official title is vice president of product management for Android, has been one of the more public faces of the mobile operating system, appearing frequently at Google press events and at its annual I/O developer conference. 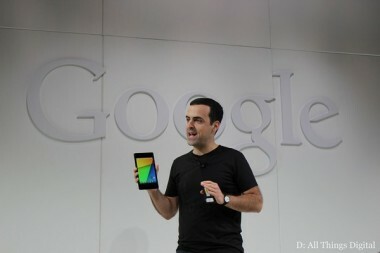 It was Barra, for example, who showed off the Nexus 7 tablet at its recent launch in San Francisco. Barra, sources said, is leaving for a job at Xiaomi, a fast-growing Chinese phone maker. Xiaomi, which builds Android phones for the Chinese market, prides itself not only on its high-end hardware, but also on the software it adds on top of Google’s operating system. After joining Google in March of 2008, Barra rose through the company’s ranks in the ensuing years, going from group product manager to vice president of Android product management. Barra joined Google from speech technology firm Nuance. Sources close to the situation told AllThingsD that Barra recently tendered his resignation, but that it came before a recent thorny personal situation related to the end of a romantic relationship he had with another Googler. That Googler is now seeing the company’s co-founder Sergey Brin, but sources said his decision to leave the company is unrelated and was made before he was aware of the new relationship. As AllThingsD reported earlier today, Brin has split with his wife, and is in involved with another Google employee, a difficult and fraught situation. A Google representative could not immediately say how Barra’s responsibilities will be handled. Barra was not immediately available for comment. Barra’s exit from Google is a significant one for the company and its Android division. Earlier this year, Andy Rubin, creator of Android, abruptly stepped down from that team, ostensibly to “start a new chapter at Google.” Coming as it does so quickly in the aftermath of Rubin’s pivot, Barra’s exit could cause ripples in one of Google’s most important divisions, the front line of its battle for mobile. Barra’s departure, along with Rubin’s shift, raises questions about just where Google will take Android in the coming years, and who will guide that effort. Android has taken a clear global lead when it comes to powering smartphones. However, concerns remain about whether handset makers other than Samsung can make a decent profit margin building devices for the OS. Google also faces continued concerns from partners and customers around fragmentation and other issues, including how closely the software is tied with other Google services, and the challenges users face in trying to upgrade their devices. Also of note is that Android’s app and content ecosystem, while large, doesn’t seem to persuade customers to open their wallets to the same degree as those who buy Apple devices. Update: Google confirmed Barra’s departure, but offered no further details on who will be taking over his duties. Update 2: In a post to Google+, Barra said he’s joining Xiaomi as Vice President of Xiaomi Global.